Rock Climbing: The jagged peaks and extensive wall faces of the San Juan Mountains provide a variety of climbing and bouldering routes. Legendary climbers, from Lynn Hill to Charlie Fowler, have explored the area and help put the San Juan Range on the map as a climbing destination. 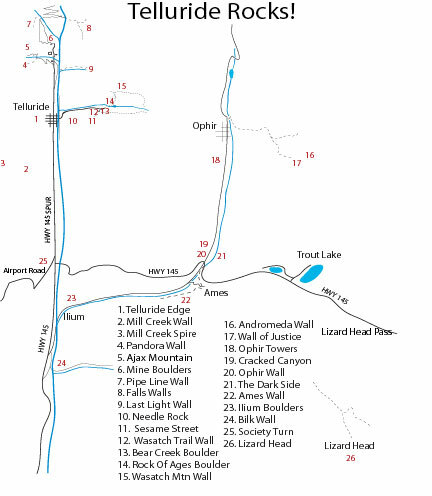 From classic routes on Ophir Wall to moderate climbs on Pipeline, the climbing is diverse and plentiful. Warm up at Adventure Rock in Mountain Village. This manmade climbing boulder is located in Conference Center Plaza and is open daily during (weather permitting) from 9 a.m. to 8 p.m. in the summer. Various problems offer challenges for novices to expert climbers. For those learning the sport or seeking local expertise, a number of guide services are available. Find local trail maps, route information and gear at one of the many sport shops. Ice Climbing: The alpine setting of the San Juan Mountains offers world-renowned ice climbing and provides a wide variety of winter climbing opportunities. To fully explore the winter climbing routes, we recommend the expertise of a local guide. Standing 365 feet tall, Bridal Veil Falls is Colorado’s tallest free-falling waterfall, and one of the most classic and difficult ice climbs in the country. Having been closed to climbing for the better part of a few decades, with the exception of a few brief openings, the climb re-opened to the public in the winter of 2008-09. An agreement was reached through negotiations between The Trust for Public Land and the Idarado Mining Company, with support and advocacy from San Miguel County, Telluride Mountain Club and the Access Fund. The agreement awarded a revocable public access license that grants climbers access to this world-class ice climb. Access is contingent on climbers’ awareness and compliance with a number of rules: Climbers must sign in at a kiosk; avoid the Powerhouse area at the top of the falls; and all descents must be via rappel.